The latest Prosperity Watch from Dr. Patrick McHugh at the N.C. Budget and Tax Center pours another big bucket of cold water on conservative claims (frequently trumpeted by former Governor pat McCrory) that their slash and burn austerity policies have somehow engineered a rousing economic comeback in North Carolina. The hard truth: North Carolina continues to lag behind. North Carolina’s economic performance over the last year has not kept up with many states in our part of the country. Labor market figures for June show that job growth over the last year has fallen short of the broader South Atlantic region in almost every industry sector tracked by the Bureau of Labor Statistics. As shown here, North Carolina and the greater Southeast Region both added jobs over the last year. However, North Carolina’s growth of 1.7% trailed the 2.1% growth rate posted by the region (defined by the U.S. Bureau of Labor Statistics as including Delaware, Maryland, the District of Colombia, West Virginia, North Carolina, South Carolina, Georgia, and Florida). Perhaps even more alarmingly, the largest shortfalls are in sectors that have traditionally been the bedrock of the working middle class in North Carolina. Employment in construction, for example, expanded by 3.4% over the last year across the South Atlantic region, a rate of growth over six times faster than North Carolina’s 0.6% growth. 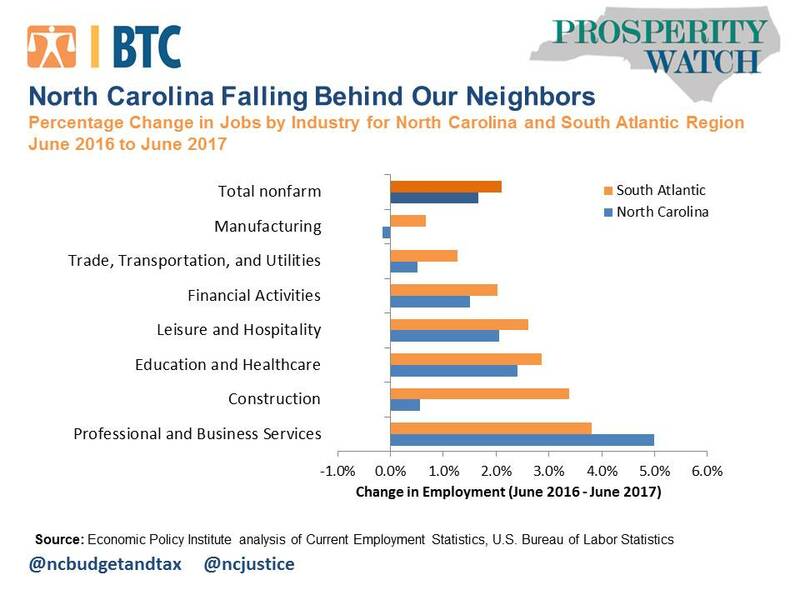 The story is even worse when it comes to manufacturing: North Carolina actually lost jobs over the last year while the broader South Atlantic Region added jobs in the sector. The lone sector where North Carolina exceeded the rate of growth for the broader region has been in Professional and Business Services, where North Carolina added 5% more jobs over the last year. This bright spot is certainly important, but it is also a sector that often requires advanced training beyond the reach of many working North Carolinians. The trends make one thing clear. Meager job growth — specifically in sectors that have traditionally been the source of many family-supporting jobs — is placing enormous burdens on an already challenged middle class in North Carolina.